The Internet of Things or the Internet of things - I expect we are to experience its significance with the caps so thought I'd check it out. It is the interconnection via the Internet of computing devices embedded in everyday objects, enabling them to send and receive data. What are five things that already are examples of the IoT? So I went hunting for 'crazy connected things' and hoped that the press would find some interesting products. However, they turn out to be automations of our every-day things - just like the definition says - kitchen appliances, hairbrush, toothbrush, locks, etc. they free us from thinking about these things that we might consider mundane. I did like all the interesting names they give the devices - Awair, Jasper, Roost, June, Deako. Panasonic's Smart Table is a lot more than a surface -- users can check their emails and phone calls, video-call others, and more all while sitting at their kitchen table. This interactive wooden table enables users to view content on its surface, and heats or cools drinks or food. The table features integrated wireless device charging and syncing capabilities and multiple infrared range sensors and cameras -- all backed by a proprietary operating system. Panasonic's Smart Table is still in the prototype stage. There are many "Why Should You Care?" articles. They target corporations and employees. So the skillsets of tomorrow will be more complicated/complex. I can possibly project where my generation is going to fall behind. My parents' generation fell behind on computers and using software applications. Our generation may consider that we know how to do everyday things manually, so we we could consider many of these devices unnecessary and frivolous. 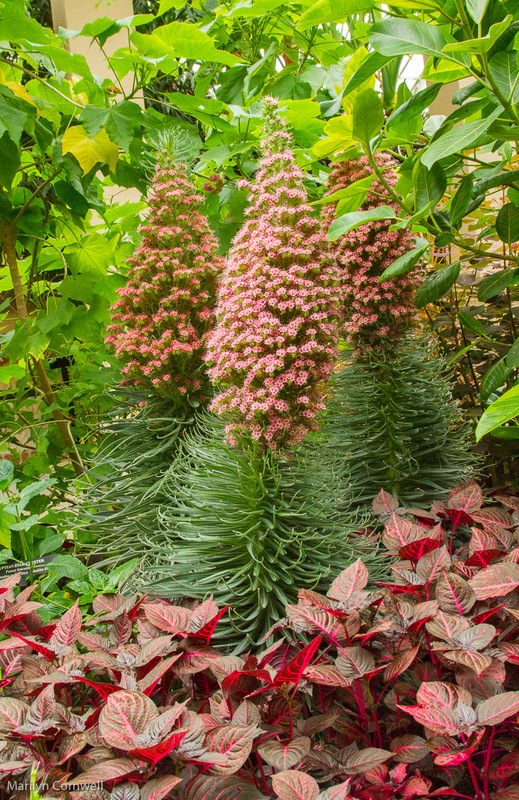 Yesterday's plant from Longwood is called Tower of Jewels and is from the Canary Islands. While the ones at Longwood were 4 feet tall, it can grow up to 10 feet tall. Today's picture shows the plants.